How do you go about clearing out and paring back your garden, in the vein of the 'tidying up' guru du jour, Marie Kondo? Sometimes the answers are easier than you expect. If you don't want a complicated plot, look at the line and shape. Simplify by replacing scalloped borders with one big flowing line. Consider removing finicky features such as rockeries which can be challenging to maintain. Maintaining complex styles can be hard going. Cottage gardens, new perennial style and large collections of pots and containers look great but need a lot of attention and knowledge. It may be easier to manage simple, contemporary ideas that use a few materials, strong lines and plants that stand out at different times of the year. Italian renaissance-style parterre gardens or courtyard styles that originate in Mediterranean regions can work for smaller spaces. With a good choice of planting using evergreen blocks such as topiary Taxus (yew) or Ilex crenata (a type of holly) as hedging you can create strong bones and focal points. You can lay out a pleasing garden which develops beautifully over time. A good physical spring clean can work wonders. Hire a quality power wash and blast away stains, moss and lichen from footpaths, walls and decks. Too heavy a hand can cause damage to masonry, brickwork etc. Where moss is the problem, use Mossoff by Vivagreen; it's a wildlife-friendly cleaner that's safe around children and pets. Ensure your choice of paint is suitable for masonry or exterior wood. Dig out weeds, roots and all. Rake over the bare soil and spread 5cm of fine grade forest bark to create a clean look. Turn an old garden shed into a garden pavilion by opening up the front or one side of it. You may need to bolster the interior by adding some wooden beams. Inside you could put a bench or even a table and chairs. A well maintained lawn can be the making of a garden. A constant mowing schedule will keep weeds from invading. Other essential jobs include feeding, aerating, scarifying and keeping the edges sharp. Careful selection of trees and shrubs - the wrong plant in the wrong place can become a problem down the line. Gain an understanding of the plants you are planning to use and what they like. 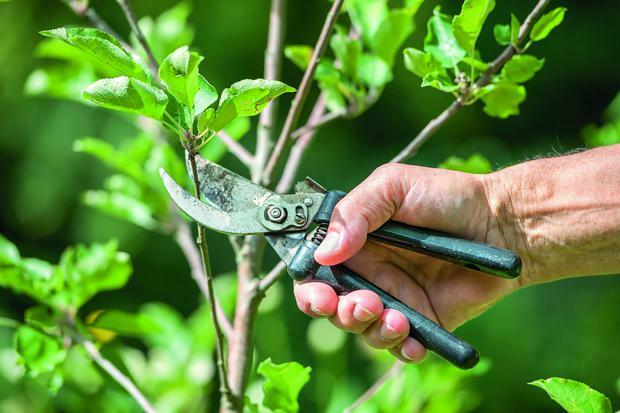 Pruning can be a great way of clearing excess and opening up spaces. March can be your last chance to prune before growth really takes off. Summer flowering shrubs, such as fuchsia, spiraea, perovskia, lavatera, buddleja, and deciduous ceanothus (eg, Gloire de Versailles) usually flower on new growth so a good chop now will stimulate plenty of this. If you do this too early in winter, you will have tender new growth which is then susceptible to frosts. Simply put, you want to remove most of last year's growth - just leave one or two buds of this; don't go back into older wood. Fuchsia can be cut nearly back to ground level. Prune shrub roses now as it will turboboost them into growth and flowering later on. The same applies to late summer flowering clematis - these can be cut right down to grown level to just above a pair of buds. There's a group of evergreen toughies that are probably in most gardens. You can cut them down to size now - aucuba japonica, hypericum, euonymus, laurels, viburnum tinus, box and hollies will all take a hard pruning, almost to ground level. Yew can also be cut back hard but don't try this with other conifers as they do not respond well to pruning. More tender evergreens such as pittosporum should be left until summer. Shrubs grown for colourful stems such as Cornus and salix can be cut back hard to promote fresh stems. Included here is Eucalyptus gunnii if you grow it for its stems and juvenile foliage. And if you've any energy left, bamboos will just need dead stems removing - cut them out completely at ground level. Anything coming into flower or about to flower such as forsythia, ribes, evergreen ceanothus, philadelphus and weigela - you will be left without any blossoms. On older, established shrubs remove about one-third of old stems. Lawnmower: A good quality lawnmower (serviced and sharpened if you can before Easter). Trowel: Look for a comfortable handle with a well-fitted blade. Examine the quality of where wood joins with metal when considering a purchase. Kneeler: I like using knee pads - especially when digging holes for planting small plants with a spade or tilling the bed with a garden fork. Long-handled spades, shovels and forks: Strong, not too heavy and comfortable to use. Invest in the best that you can afford. Make sure that you find the handle and shaft length comfortable. Secateurs: The Classic Felco no4 is affordable and will last a lifetime. Shears: Good for trimming hedges and cutting back larger areas of plant growth. They're typically used for cutting back or shaping shrubs and ornamental grasses, and cutting back flowering plants after blooming season. Wheelbarrow: Go for an 85-litre galvanised steel tray barrow with a choice of pneumatic wheel. Lightweight and durable. Garden twine: Look for tar-soaked, waxed or twine made of trendy sea grass. Watering can: Well-balanced is essential. A well-designed one won't put a strain on your body when watering. Choose a 6-10 litre vessel for gardens and larger pots to minimise refills. My choice would be a strong, galvanised can. 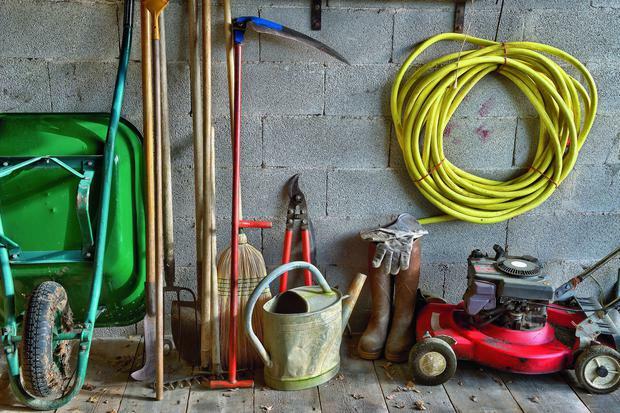 Once you've bought your essential garden tools, you need to look after them. They will often last for decades if you do. Keep a stiff brush and clean rags in your garage or potting shed. Brush soil or garden debris off the tools after use. A quick wipe with the cloth prolongs the life and performance of your tools and saves you from a big tool cleaning job over winter. It soon becomes second nature. Ornamental cherries, plums and almonds should not be touched. Leave until late summer otherwise you risk silver leaf disease. Birch should also be left until late summer or early autumn as it will bleed. I would tend to leave alone rhododendrons, camellias and daphnes.